The Chinese has begun to produce paper since 100 B.C. during the Han Dynasty. It has then become one of the four great ancient inventions of China, which contributed greatly to the world’s civilization. Today, ancient way of hand-made paper has been replaced by modern production and process. However, in the remote places in the Southwestern of China’s Guizhou Province, where many people of ethnic-minority groups live, the tradition of hand-made paper is still kept. 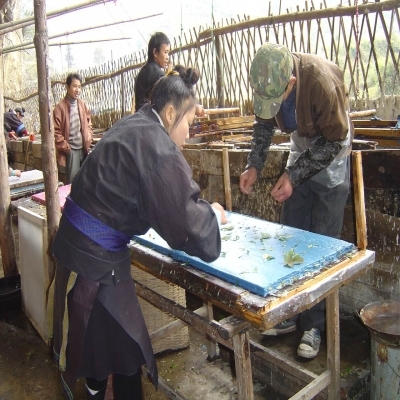 Shiqiao Village of Danzhai County is one of the villages where villagers continue to earn their living by producing and selling hand-made papers and products. However, with modern technology, changing demand and behavior of consumers, the number of villagers who can survive by keeping this tradition has declined from year to year, to left around 40 families only. Guizhou Tourism Administration considers tourism to be one of means to reduce poverty and increase the quality of life for the people. The Administratiion thus aims to preserve this tradition while at the same time promoting this unique culture to the world. PATA Foundation is pleased to award its grants to this worthy project in China, where no grant has been awarded to in the past many years. With tremendous growth China tourism is experiencing, it is increasingly crucial to take necessary steps to ensure sustainable growth. The Foundation hopes to continue its co-operations with Chinese government in preserving country’s culture and heritage which are dated back over thousands years of civilization”.